The Kingdom of the Two Sicilies (Neapolitan: Regno dê Doje Sicilie, Sicilian: Regnu dî Dui Sicili, Italian: Regno delle Due Sicilie, Spanish: Reino de las Dos Sicilias) was the largest of the states of Italy before the Italian unification. It was formed as a union of the Kingdom of Sicily and the Kingdom of Naples, which collectively had long been called the "Two Sicilies" (Utraque Sicilia, literally "both Sicilies"). The Kingdom of the Two Sicilies lasted from 1815 until 1860, when it was annexed by the Kingdom of Sardinia to form the Kingdom of Italy in 1861. The capitals of the Two Sicilies were in Naples and in Palermo. The kingdom extended over the Mezzogiorno (the southern part of mainland Italy) and the island of Sicily. Jordan Lancaster notes that the integration of the Kingdom of the Two Sicilies into the Kingdom of Italy changed the status of Naples forever: "Abject poverty meant that, throughout Naples and Southern Italy, thousands decided to leave in search of a better future." Many went to the new world. The kingdom was heavily agricultural, like the other Italian states; the church owned 50–65% of the land by 1750. The name "Two Sicilies" originated from the partition of the medieval Kingdom of Sicily. 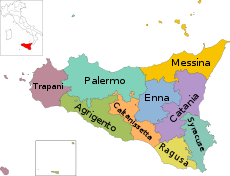 Until 1285, the island of Sicily and the Mezzogiorno were constituent parts of the Kingdom of Sicily. As a result of the War of the Sicilian Vespers (1282–1302), the King of Sicily lost the Island of Sicily (also called Trinacria) to the Crown of Aragon, but remained ruler over the peninsular part of the realm. Although his territory became known unofficially as the Kingdom of Naples, he and his successors never gave up the title "King of Sicily" and still officially referred to their realm as the "Kingdom of Sicily". At the same time, the Aragonese rulers of the Island of Sicily also called their realm the "Kingdom of Sicily". Thus, there were two kingdoms called "Sicily": hence, the Two Sicilies. The Kingdom of the Two Sicilies resulted from the re-unification of the Kingdom of Sicily with the Kingdom of Naples (called the Kingdom of Peninsular Sicily), by King Alfonso V of Aragon in 1442. The two states had functioned as separate realms since the War of the Sicilian Vespers in 1282. At the death of King Alfonso in 1458, the kingdom again became divided between his brother John II of Aragon, who kept the island of Sicily, and his illegitimate son Ferdinand, who became King of Naples. In 1501, King Ferdinand II of Aragon, son of John II, conquered Naples and reunified the two kingdoms under the authority of the newly united Spanish throne. The Kings of Spain then bore the title King of Both Sicilies or King of Sicily and of the Two Coasts of the Strait until the War of the Spanish Succession. [citation needed] At the end of that war, the Treaty of Utrecht in 1713 granted Sicily to the Duke of Savoy until the Treaty of Rastatt in 1714 left Naples to the Emperor Charles VI. In 1720 the Emperor and Savoy exchanged Sicily for Sardinia, thus reuniting Naples and Sicily. In 1734, Charles, Duke of Parma, son of Philip V of Spain, took the Sicilian crown from the Austrians and became Charles VII & V, giving Parma to his younger brother, Philip. In 1759, Charles became King Carlos III of Spain and resigned Sicily and Naples to his younger son, who became Ferdinand III of Sicily and Ferdinand IV of Naples, later crowned Ferdinand I of the Two Sicilies in 1816. Apart from an interruption under Napoleon, the Kingdom of the Two Sicilies remained under the Bourbon line (Bourbon Duo-Sicilie) continually until 1860. In January 1799, Napoleon Bonaparte, in the name of the French Republic, captured Naples and proclaimed the Parthenopaean Republic, a French client state, as successor to the kingdom. King Ferdinand fled from Naples to Sicily until June of that year. In 1806, Napoleon, by then French Emperor, again dethroned King Ferdinand and appointed his brother, Joseph Bonaparte, as King of Naples. In the Edict of Bayonne of 1808 Napoleon moved Joseph to Spain and appointed their brother-in-law, Joachim Murat, as King of the Two Sicilies, though this only meant control of the mainland portion of the kingdom. Throughout this Napoleonic interruption, King Ferdinand remained in Sicily, with Palermo as his capital. The Congress of Vienna restored King Ferdinand in 1815. He established a concordat with the Papal States, which previously had a claim to the land. Cappella Palatina, church of first unifier Roger II of Sicily. A monarchy over the areas which would later become known as the Two Sicilies existed as one single kingdom, including a peninsular and an insular part, dating from the Middle Ages. The Norman king Roger II formed the Kingdom of Sicily by combining the County of Sicily with the southern part of the Italian Peninsula (then known as the Duchy of Apulia and Calabria) as well as with the Maltese Islands. The capital of this kingdom was Palermo — which is on the island of Sicily. The state existed in that form from 1130 until 1285. In the period of the Capetian House of Anjou during the reign (1266–1285) of King Charles I, the kingdom was split by the War of the Sicilian Vespers of 1282–1302. Charles, who was of French origin, lost Sicily proper to the House of Barcelona, who were Aragonese and Catalan, after they were able to gain the support of the natives. Charles remained king over the peninsular part of the realm, thereafter informally known as the Kingdom of Naples. Officially Charles never gave up the title of "The Kingdom of Sicily", thus there existed two separate kingdoms calling themselves "Sicily". Only with the Peace of Caltabellotta (1302), sponsored by Pope Boniface VIII, did the two kings of "Sicily" recognize each other's legitimacy; the island kingdom then became the "Kingdom of Trinacria" in official contexts, though the populace still called it Sicily. Eventually by 1442 the Angevin line of the Kings of Naples was coming to an end. Alfonso V of Aragon, king of insular Sicily, conquered Naples and became king of both (1442). Alfonso V described the geographical area in Latin as Utriusque Siciliæ, meaning "of both Sicilies", and used the name as part of his title. [not in citation given] After the death of Alfonso in 1458, both Sicilies remained under the direct rule of the Crown of Aragon, but Naples had a different Aragonese king from the island of Sicily from 1458 until 1501. For a brief period Naples was controlled by a different power other than Sicily, in the form of French king Louis XII of France, who took the mainland kingdom and held it (1501–1504) for around three years. After the French lost the Battle of Garigliano (1503), the last Aragonese king, Ferdinand II of Aragon, re-united the two areas once again under control of the same power and the same king. From 1516, when Charles V, Holy Roman Emperor became the first King of Spain, both Naples and Sicily came under direct Spanish rule. In 1530 Charles V granted the islands of Malta and Gozo, which had been part of the Kingdom of Sicily for four centuries, to the Knights Hospitaller (thereafter known as the Order of Malta). The period of direct Spanish rule under the same line of kings lasted until 1713, when control of Spain and of both Sicilies passed to the French prince Philip, duke of Anjou, who founded the Spanish branch of the House of Bourbon. After an eight-year spell of Savoy rule in Sicily (1713–1720), the two Sicilian kingdoms once again came under the same king after the Treaty of The Hague (1720) appointed the Austrian king Charles VI, Holy Roman Emperor as their ruler. The kingdoms were conquered from the Austrians by a young Spanish prince during the War of the Polish Succession; he became Charles VII of Naples. The two kingdoms were then recognised as both independent and under Charles' rule as a cadet branch of the Spanish Bourbons by the Treaty of Vienna. After Charles' brother, Fernando VI of Spain died childless, Charles inherited the Spanish Crown in 1759, reigning as Charles III of Spain. His son Ferdinand then became king of the two kingdoms so as to maintain them as separate realms as required by the treaties restoring the junior Spanish royalty to the southern Italian kingdoms. Ferdinand was highly popular with the poorest class. Ferdinand's reign was highly eventful. For a brief period the Parthenopaean Republic controlled Naples with the support of those who supported the French Revolution. However, a counter-revolutionary army of the poorest class retook Naples in order to restore royal power. Eight years later, Napoleon conquered the peninsular portion of the kingdom during the War of the Third Coalition and placed his brother Joseph Bonaparte on the throne as King he conferred the title "Prince of Naples" on his children and grandchildren. Ferdinand fled to his other kingdom, on the island of Sicily itself. Here the alliance he had previously made with George III of the United Kingdom and Tory Prime Minister the Earl of Liverpool saved him. The British protected Ferdinand and the island of Sicily from Napoleonic conquest with the presence of a powerful Royal Navy fleet. Back on the mainland, Joachim Murat had become the second Bonapartist king. In the Edict of Bayonne he was named as "King of the Two Sicilies", though de facto he never actually held the island of Sicily where Ferdinand was, and is usually referred to as just the King of Naples. Murat actually switched sides for a while, abandoning the Grand Army after the disastrous Battle of Leipzig in an attempt to save his Neapolitan throne. However, as the Congress of Vienna progressed, tensions arose as there was strong pressure to restore Ferdinand to the Neapolitan kingdom as well as keeping his Sicilian one. Murat returned to Napoleon and together they declared war on the Austrian Empire, leading to the Neapolitan War in March 1815. Ferdinand and his allies Austria, Britain and Tuscany were victorious, restoring him to his Neapolitan throne. To avoid further French attempts, it was agreed at the Congress of Vienna that Ferdinand would reunite his kingdom. When talking about the period from 1816 until 1861, historians refer to the Kingdom of Naples and the Kingdom of Sicily together as one state - the Kingdom of the Two Sicilies. For the period prior to 1816, instead, historians refer to them separately with their own name, as they were separate kingdoms. Between 1816 and 1848, the island of Sicily experienced three popular revolts against Bourbon rule, including the revolution of independence of 1848, when the island was fully independent of Bourbon control for 16 months. In 1860, Sicily was invaded by a corps of volunteers, led by Giuseppe Garibaldi from the Kingdom of Sardinia. They successfully conquered the Kingdom of the Two Sicilies, and incorporated the territory into the new Kingdom of Italy. Industry was the highest form of income if compared with the other preunitarian states. One of the most important industrial complexes in the kingdom was the Shipyard of Castellammare di Stabia, which employed 1800 workers. The engineering factory of Pietrarsa, was the largest industrial plant in the Italian peninsula producing tools, cannons, rails, locomotives. The complex also included a school for train drivers, and naval engineers and thanks to this school, the kingdom was able to replace the English personnel which was necessary until then. The first steamboat with screw propulsion known in the Mediterranean Sea is the "Giglio delle Onde", with mail delivery and passenger transport purposes after 1847. In Calabria were located the Fonderia Ferdinandea was a large foundry where cast iron was produced. The Reali ferriere ed Officine di Mongiana was an iron foundry and weapons factory. Founded in 1770, it employed 1600 workers in 1860 and closed in 1880. In Sicily (near Catania and Agrigento), sulphur was mined for gunpowder. The Sicilian mines were able to satisfy most of the global demand for sulfur. Silk cloth production was focused in San Leucio (near Caserta). The region of Basilicata also had several mills in Potenza and San Chirico Raparo, where cotton, wool and silk were processed. Food processing was widespread, especially near Naples (Torre Annunziata and Gragnano). Almost 99% of the industries present in the Kingdom were destroyed and relocated to the north by the occupying forces of the house of Savoy after the unification. In 1860–61 the kingdom was conquered by the Kingdom of Sardinia, and the title dropped. It is still claimed by the head of the House of Bourbon-Two Sicilies. Francis I, King of the Two Sicilies, of Jerusalem, etc., Duke of Parma, Piacenza, Castro, etc., Hereditary Grand Prince of Tuscany, etc. The laws of the deposed Sicilian dynasty and the Pragmatic Decree of Charles III, issued by him as King of Spain and the Two Sicilies on 6 October 1759, required a renunciation only if the Crown of Spain (or the heir apparent thereto) and the "Italian sovereignties" were united in the same person, and in no other circumstances. This could only have happened in 1900 if the Count of Caserta, his oldest son Ferdinand, and King Alfonso XIII had all died, thereby leaving Prince Carlo as heir to the Two Sicilies crown and his wife as Queen of Spain, and if the Two Sicilies crown had been restored. It is claimed that theories advanced to suggest that the 1900 renunciation were in some way unnecessary have been formulated long after the fact,[citation needed] but by 1907 a son (the first of four, along with two daughters) had been born to Alfonso XIII and Queen Victoria Eugenia and Prince Carlos's older brother Ferdinand had also had a son, Roggero, Duke of Noto, so it soon became irrelevant. 2015–present: Pedro, Duke of Calabria, (married to D. Sofia de Landaluce y Melgarejo, a descendant through her mother of the Dukes of San Fernando de Quiroga). 1960–1973: Prince Ranieri, Duke of Castro (died 1973), married to Countess Maria Carolina Zamoyska (whose mother was a Princess of Bourbon-Two Sicilies). 1973–2008: Prince Ferdinand, Duke of Castro, who had one son and two daughters by his wife Mlle Chantal de Chevron-Villette, including Princess Béatrice, the former wife of Prince Charles Napoléon. The Volcano Lover, a novel by Susan Sontag, is set in the Kingdom of the Two Sicilies during the Napoleonic era. ^ Swinburne, Henry (1790). Travels in the Two Sicilies (1790). British Library. ^ a b c d e "Sicilian History". Dieli.net. 7 October 2007. ^ a b Colletta, Pietro (1858). History of the Kingdom of Naples (1858). University of Michigan. ^ "The Battle of Tolentino > Joachim Murat". Tolentino815.it. 7 October 2007. ^ Blanch, L. Luigi de' Medici come uomo di stato e amministratore. Archivio Storico per le Province Napoletane. ^ "Alfonso V, or Alfonso el Magnánimo". Britannica.com. 7 October 2007. ^ "Charles of Bourbon – the restorer of the Kingdom of Naples". RealCasaDiBorbone.it. 7 October 2007. Archived from the original on 26 September 2009. ^ "The Parthenopean Republic". Faculty.ed.umuc.edu. 7 October 2007. Archived from the original on 29 June 2009. ^ a b "Austria Naples – Neapolitan War 1815". Onwar.com. 7 October 2007. ^ "Ferdinand IV King of Naples and Sicily (Ferdinand I as King of the Two Sicilies)". RealCasaDiBorbone.it. 7 October 2007. Archived from the original on 29 December 2006. ^ "Joachim Murat,". Emeliefr.club.fr. 7 October 2007. ^ Pompilio Petitti (1851). Repertorio amministrativo ossia collezione di leggi, decreti, reali rescritti ecc. sull'amministrazione civile del Regno delle Due Sicilie, vol. 1 (in Italian). Napoli: Stabilimento Migliaccio. p. 1. ^ Pompilio Petitti (1851). Repertorio amministrativo ossia collezione di leggi, decreti, reali rescritti ecc. sull'amministrazione civile del Regno delle Due Sicilie, vol. 1 (in Italian). Napoli: Stabilimento Migliaccio. p. 4. ^ Sainty, Guy Stair. "ChivalricOrders.org". The Two Sicilies Succession. Guy Stair Sainty. Archived from the original on 6 February 2012. Retrieved 13 June 2015.